During the past few years, Social Media has become a significant part of our lives. So significant that it’s very rare to find people without a social media profile. The Daily Mail even went so far as to say that if you are not on Facebook, your employers and psychiatrists may think you’re a bit strange. According to the German magazine Der Taggspiegel, the shooter James Holmes and Norwegian mass murder Anders Behinger Breivik have one thing in common – neither one of these individuals has a Facebook profile! Ah-oh, maybe they are onto something here… The bottom line is that Social Media has become the daily “news headline we read every morning,” and if you’re not a part of it you’re automatically going to be labeled as questionable at best. Questionable is never a good thing when you’re doing business. Many businesses, however, do desire to use popular Social Media networks such as Google+, Facebook, Twitter and Pinterest for brand exposure and promotion of their products or services but are confused about how to start sharing. So, we’ve put together a simple “How To” guide for sharing and pitching your content virally for all of these top social sites with a particular focus on Pinterest since it’s the latest to emerge on the scene and rapidly becoming a leading social site. Social media sharing is easy to get the hang of, and once you do, you will be unstoppable! So first, let’s start with Google+. 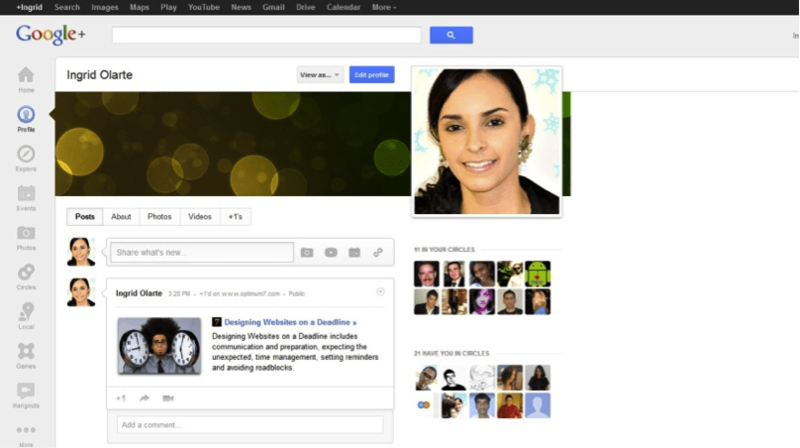 Google+ is fast growing in popularity and many speculate that it will become the next big thing. So why is Google+ so important? The beauty of Google+ is the various functionalities and options available to benefit your business. How can your business leverage from Google+? Google+ Local is integrated with Google+. This means that if your business has an existing Google+ profile it will automatically be listed on Google Local. Google indexes the content you post on your profile, which translates to tremendous benefits such as greater visibility, backlinks and higher rankings at no cost. The key to a successful Google+ account is maintaining a constant flow of content and regular posts to fully benefit from Google and the SERPS. Under “Share what’s new” you may share thoughts and articles. To better optimize your content or comments you should use hashtags. Copy and paste the URL into Update Status. Wait for a few seconds until the browser refreshes and finds the URL. Once the URL is submitted, add a unique call to action in order to get attention from your friends (e.g. Check out our latest Video Marketing tips for SEO success!). Final Step: Post the article. Twitter is the social media site that I find most interesting. Twitter is fantastic for sharing your content, gaining followers and building relationships. In the past year, our company has leveraged from sharing our articles and news through Twitter. With this being said, we have had wonderful opportunities such as guest blog commenting and re-tweets for many of our articles. Shorten the URL of the link you want to share as Twitter only accepts 140 characters. Use sites such as Short URL, Tiny URL or YOURLS. Post an attention grabbing phrase and hashtag for any industry relevant keywords to better optimize your tweet. By adding hashtags you are giving your content wings to reach Twitter users far and wide. In this example you can see that I have shortened my URL, added a call to action and pitched it to the people I am interested in pitching my content to. Pinterest is the latest of these platforms to grab the attention of business owners worldwide. As a result, we’ve chosen to elaborate on Pinterest. 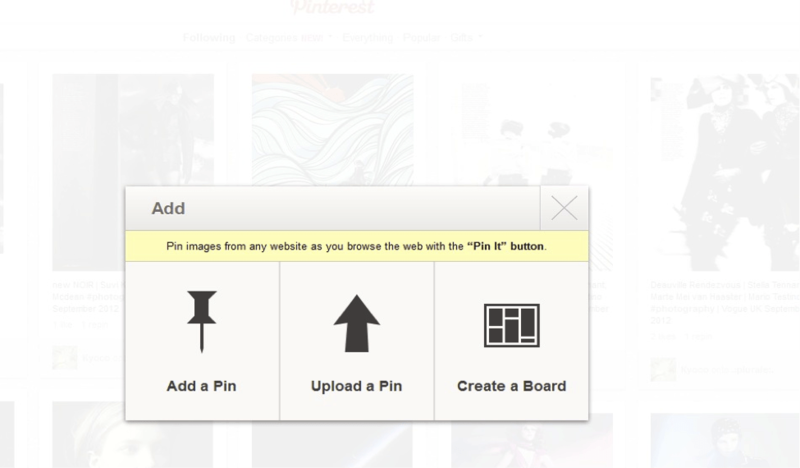 So, what exactly is Pinterest? 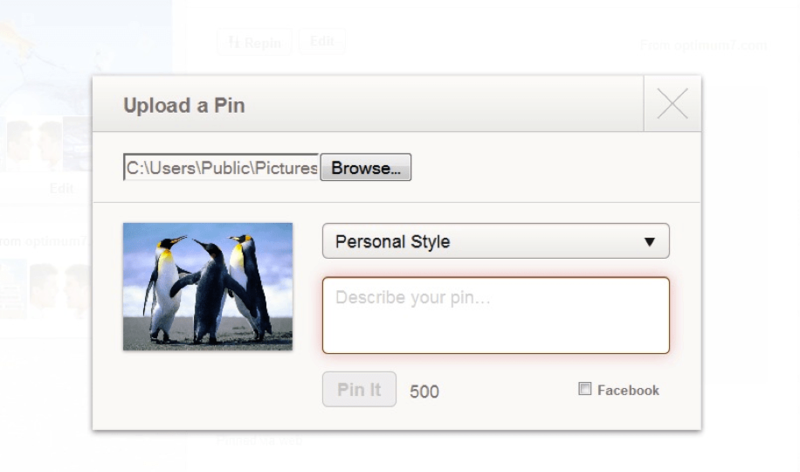 Pinterest is all about sharing pins and posting pictures. We understand that this new Social Media network is unfamiliar to many of you and that it can be intimidating and tricky at times for a first time user… So just follow these simple steps to get you started. 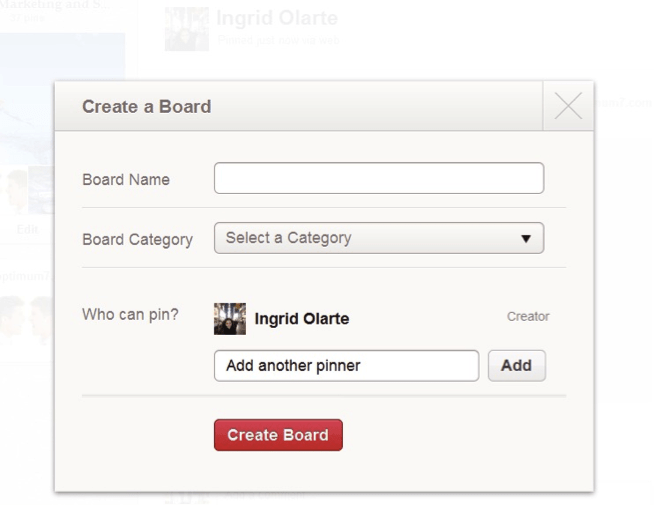 Create a Board – This is where your images or “pins” will exist online. Think of it as a giant cork board where you can thumbtack your images. Create a name for the board (e.g. Internet Marketing Articles) and select the category to which it belongs (e.g. Education). Creating boards can also help you display your images by categorizing them. 3. Final Step – Pin It! This is what your pin should look like. 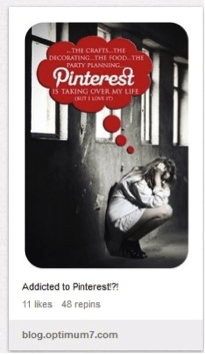 How Can My Business Benefit from Pinterest? 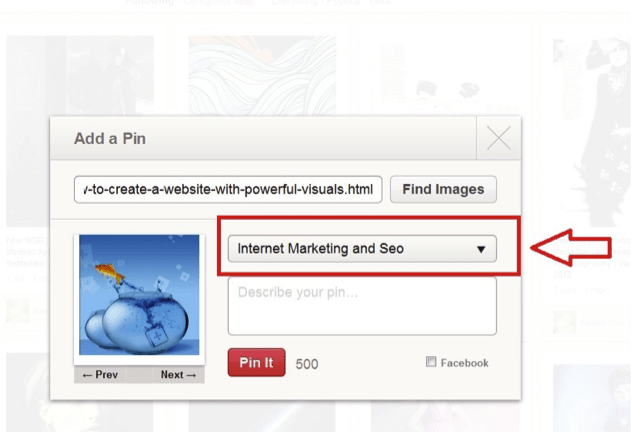 Can You Acquire Valuable Backlinks from Pinterest? Word of Caution: Unfortunately, when you acquire a link from these Social Media sites, you acquire what is called a no-follow link. This means that your site backlink juice will not be transferred to your site. So basically, your backlink is not being indexed by Google. This does not mean you’re not getting the full benefit of a no-follow link. 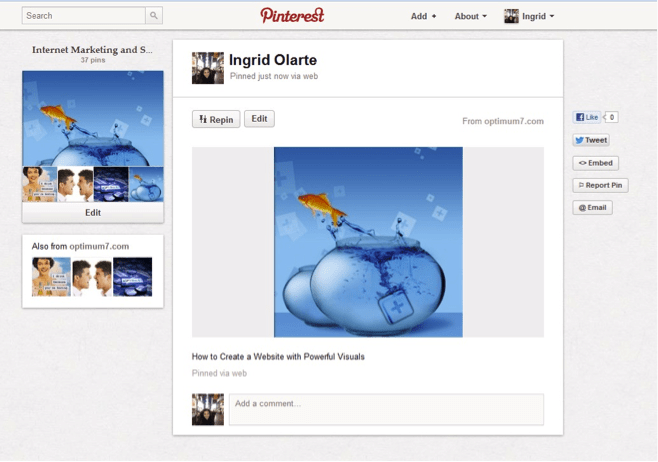 The idea here is encouraging the Pinterest user to share your pins and create a following. For example, when a Pinterest user is wowed by your pin, and decides to click on it, it will redirect back to your website. This is otherwise known as referral traffic which will boost your SEO efforts. 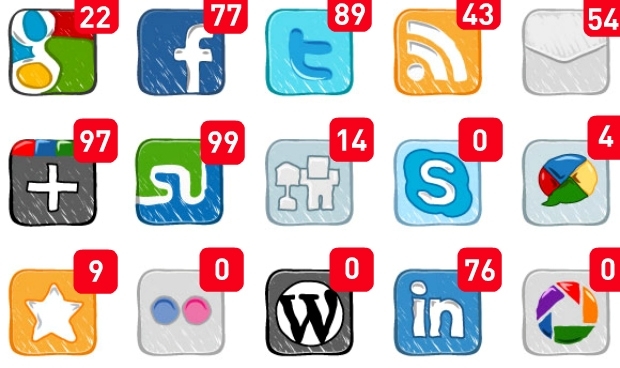 Are No-follow Links Valuable for Social Media? There has been a lot of debate about no-follow links. I believe that your website can still benefit from no-follow links from high PageRank sites. When a user on Pinterest repins or visits your site, you are leveraging from this user because he or she is sharing your content. Your articles have a better chance at being ranked higher on the SERPS when someone shares your content. Pinterest is all about visuals. The more interesting your visuals are, the more chance you have of your images being repined and liked by others. In the image below I have provided an example of a successful pin I posted a couple of months ago. 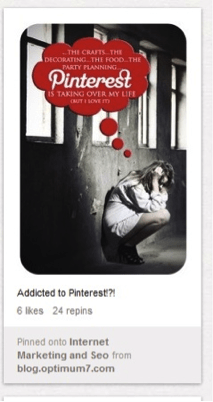 “Are you addicted to Pinterest?” This article was repined 24 times and it received 6 likes! What can we learn from this Pin? We can learn that a powerful image can get you many clicks and this can be quite a powerful tool to generate traffic back to your site. Received 24 repins one week ago. 48 Repins and 11 likes in just a week! Optimum7 are experts at Social Media Optimization. Invest in a Social Media Strategy that will boost your SEO efforts today. Contact us for an initial, no obligation consultation.